For trees, a 100 meter height is very unusual. In the recent past the coast redwood, Douglas fir, Austral eucalyps, and possibly some tropical hardwoods had extant trees over 100 meters. However in the present day all documented living trees over 100 meters in height are coast redwoods. For coast redwoods, a 100 meter height is uncommon but not rare. Humboldt Redwoods State Park contains the greatest number of very tall trees, concentrated along the Eel River south fork and Bull Creek. There is good public information on the height of individual tree crowns in this area, originating in LiDAR point cloud data. In HRSP there are about 300 hectares with demonstrated 100 meter redwoods, with an average density of about four 100 meter trees per hectare. So that results in about 1,200 redwood trees in HRSP above 100 meters in height. 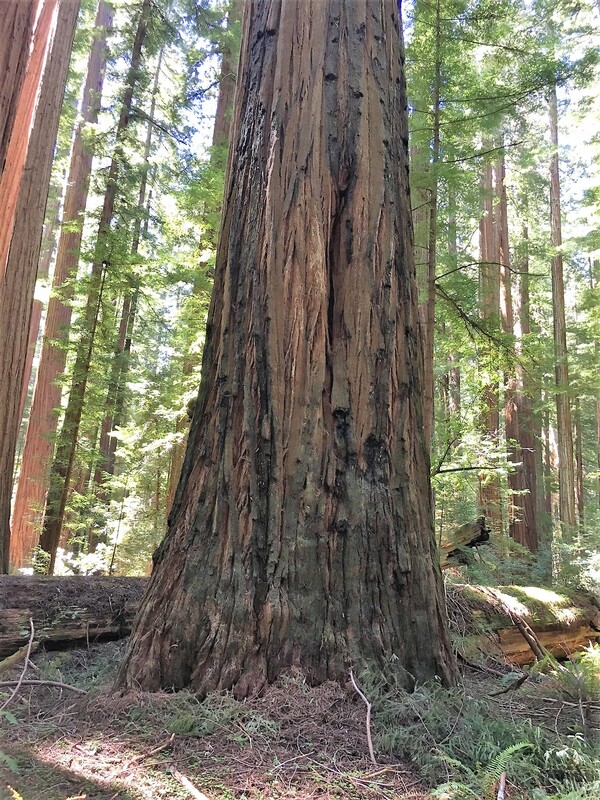 Then each of the other redwood parks with many tall trees (Redwood National Park, Prairie Creek Redwoods State Park, Jedediah Smith Redwoods State Park) likely have a similar number of 100 meter redwood trees, but there isn’t enough public data to develop definitive counts. So among the four large parks, then adding in trees from Montgomery Woods and a few other locations, there are likely around 5,000 coast redwood trees with heights above 100 meters, and 0 trees that are not coast redwoods with heights above 100 meters. Based on extensive measurement and point cloud analysis it was determined a nice round number to differentiate the tallest redwoods is 350 feet (106.7 meters), with about 225 trees above this height cutoff. That’s a pretty big drop from the 5,000 or more redwood trees over 100 meters in height. The redwoods above 350 feet continue to be measured for height changes. Some are measured annually versus others might be measured every ten years. There are a few new 350 foot trees found each year, as the “349 footers” grow into 350 feet or a new LiDAR flyover identifies some trees that were missed previously. There is a published Tall Trees list from 2000, and then these same trees can be compared to the 2013 list, to see the 13 year growth rates among the trees. All the trees on the 2000 list are also on the 2013 list, though three of these trees have fallen since 2013. In the past year three trees from the 2000 list fell (all in Humboldt). Assuming heights are uniformly distributed, this results in 12.7 height bands (38 trees, 3 inches per year per tree). Then taking the 38 trees divided by the 12.7 height bands that results in 3 new 350 foot trees in Humboldt each year based on height growth. Then based on the ratio of tall trees between parks there would be one additional 350 foot tree each year in another redwood park, likely in Redwood National Park. The 350 foot list grow in rate appears to be above the loss rate from height reduction and tree fall but time will tell. For sure there likely will be three to four new 350 foot trees each year. This redwood , Big Log on Harper Flat, added seven feet in height between 2000 and 2013. It was among the fastest growing in height during that time period. Federation Grove point cloud data, arranged to show all tree crowns over 100 meters (purple dots). There are around 250 such redwood crowns in this grove! It’s amazing at the sheer number of trees exceeding 100 meters for living Redwoods. And we might have 1 Douglas fir that was 100 meters, 30 years ago (the Doerner Fir before the top died out)- or about 329 feet in the late eighties – versus 5,000 existing coast redwood that height and taller. If I hadn’t collected over 220 historic accounts of Douglas-fir logged out between 1850-1950, exceeding 300 ft (91.5 meters) and taller, I’d doubt any Douglas fir ever exceed the 100 meter threshold. I think this shows clearly 2 phenomena: 1. The Coast Redwood is demonstrably a much taller tree on average then even the tallest Douglas fir forests, and tallest absolute trees basing off existing forests. 2. The ancient Douglas fir forests growing in the mountain lowland and coastal zones were so thoroughly logged between the latter 1800’s to mid 1900’s, that not a single representative in the 100 meter class exists today, where I have approximately 70 accounts of trees exceeding 100 meters from historic files, some of questionable reliability, others reported by foresters and surveyors, and loggers. Both papers on the theoretical height limits of Douglas-fir, and Coastal Redwood, show a maximum range in the 100 to 130 or 140 meter window, which suggests that at least some of these reports of 350 to 400 foot tall Douglas fir may have been legit, although rare and exceptional trees. Often we get reports like, farmer brown, and such and such cut down a fir and found it was 354 feet long, or “nearly four hundred feet” or some rounded up enumeration, impossible to verify in today’s age of lasers. Some of the reports made by foresters like E.T. Allen and others, indicated that the average height of the Douglas fir in optimal groves attained a median height of almost 300 feet, so it’s impossible to know the exact number of 100 meter plus trees of the past, short of unearthing more historic reports (which is a fruitful frontier by the way). Clearly though, the statistics on existing Coast Redwood blow the Douglas fir out of the water. 70 odd anecdotes best case, versus 5,000 existing confirmations, – I’d say the jury is heavily in favor of Redwood a supreme master of altitude! Clear cut case. The sheer age these redwood trees can reach, 2,000 -2,500 years and more, decay resistant bark, the optimal fog zone and temperate conditions all go in favor for this massive entity. Sadly, one likely reason why our oldest forests of Douglas fir are in a decayed state of altitude is the clear cutting around ancient groves, often exposes their brittle wooden tops to wind, so that a what was several 300 to 350 foot giants, are now snapped off at 225 feet or something, about level with the median forest of second or intermediary growth – the decay rate of the Douglas fir, and shorter life span (perhaps some rare ancient ones reach occasionally 1,200 to 1,500 years) is another factor in their over all morbidity – they just don’t live as long and vibrantly as the Redwoods. 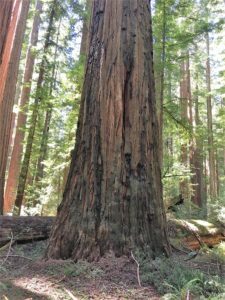 30 to perhaps 34 feet or more may have been the widest DBH on historic Coast redwoods, if the stories of the fieldbrook stump and Lindsey creek trees are valid. The largest diameter Douglas fir I could find in reputable sources were 16, 17 and 18 feet diameter, growing around Conway and Sedro-Woolley, circa 1890-1910. SOme of these allegedly exceeded 100 meters, but more information is needed. Cearly, the largest Redwoods were almost twice as thick in DBH as the Douglas-fir. That’s amazing in itself. Great information here on this post. Fascinating data! Thanks Micah. Great recap of Douglas fir height in present and in the past. Maybe there is a 100 meter Douglas fir hiding somewhere among 100 meter redwoods. That would give it wind protection. There are some Douglas fir over 90 meters in Prairie Creek, maybe also on Flint Ridge. Are those LiDAR sets available for public access? If so, where could I get them? There is some point cloud LiDAR data for redwood forests. Then that point cloud data needs to be processed, for that I have had good success using ArcGIS for Personal Use. Then ArcGIS help has instructions for working with point cloud data. For derivative products, aka processed LiDAR height maps, I haven’t found much other than a flash or two in research papers or in presentations. Open Topography LiDAR portal returns a global coverage map where you can zoom into the areas where you are interested in downloading point cloud data. There is good coverage for all of the Eel River corridor through Humboldt Redwoods State Park from a 2013 flyover. This also includes a little bit of the eastern end of Bull Creek. I used this data to do the map of the 100 meter trees in Founders Grove. The nice thing about processing point cloud data is the height bands can be specified as needed, so if a map of 350 foot redwoods was needed for personal use that could be created just as easily. Then NOAA has a data access viewer that has a good amount of point cloud LiDAR coverage for the eastern US but then generally only includes areas close to the coast in the western US. For redwoods there is good NOAA coverage for the redwood parks south of San Francisco in Santa Cruz county, almost all of Del Norte Redwoods State Park, and the near maritime areas of Prairie Creek and Redwood National Park. For example for Redwood National Park can get all of Flint Ridge, all of Trillium Falls area, and a little bit of the northern portion of Redwood Creek. All the 2007 LiDAR data that covers the areas in the northern redwood parks with tall trees is under lock and key, as far as I can determine. That was a privately funded study. I have asked for it from the parks but was turned down. I hope someday that information can be put on the Open Topography LiDAR portal. looks like the Rockefeller loop/forest is included on Open Topography. Ive heard that Rockefeller is taller than Founders on average. Have you tested to see if this is true? Yes, took a look at that. Founders Grove has about one 100 meter tree per acre versus Rockefeller Loop has about 1.75 100 meter trees per acre. In both cases that’s an amazing density of 100 meter trees. For maximum height per the LiDAR there are three trees in Rockefeller Loop that are taller than anything in Founders Grove, two by quite a bit. In the entire area, from the 2013 data, the two tallest trees were Paradox and Federation Giant and they had the exact same LiDAR indicated height. But that was five years ago, the current situation could be different. I was watching this video (https://www.youtube.com/watch?v=xfzO74NT0kM) of a presentation by robert van pelt and about 24 minutes in he showed a few pictures of those 2007 lidar sets you mentioned that were used in his study (https://www.savetheredwoods.org/wp-content/uploads/VanPelt-et-al-2016-Maximum-biomass-and-leaf-area-in-Sequoia-sempervirens-forests.pdf). some of the pics are good enough quality to where you can clearly see the crowns of trees, specifically the pics of Montgomery woods and Bull creek. its interesting to see how the those 2 forest have pretty much all of their trees over 70m concentrated in the valley bottoms leaving the slopes fairly dry where as Prairie creek and jed smith have trees 70-80m almost everywhere. The RCCI presentations are very well done. Those researchers are working very hard to quantify historic and current redwood growth potential and overall forest health. It’s hard for me to tell orange versus red but looking through everything I would estimate there are about 725 100 meter plus redwoods growing along Bull Creek, then about 115 such trees in Montgomery Woods Reserve. This includes the portions of Bull Creek that are not on the map shown in the presentation. I believe that when all the old growth was untouched up and down the redwood coast, the number of superlative Douglas firs probably exceeded the superlative coast redwoods for height. For wider girth, it should not be a surprise about coast redwood because it’s among the most decay resistant and long-living. The one thing that stands out about Douglas fir though, is that whatever there was, were virtually all single stem trees, not fused or merged trunks like Sir Isaac Newton. So a 12 ft. or 16 ft. Douglas fir may have been uncommon, but it would have been a single in most every case. I find it somewhat disappointing that we never got a chance to see the old growth forest spruce and Douglas fir that existed, or that there’s no video go provide a substantial documentary. Even good photos don’t really do the job to convey a forest. A photo can do a single tree justice, but not what 1000 acres or 10,000 acres felt and looked like. In the most recent post you tallied founders grove at 150 trees that are at least 100m tall. But based on the picture showing all the 100m points in this post there is around 220-250 in the grove. Good eye. For the that 100 meter plus map I set the purple down to 99.5 meters. Someone mentioned to me old growth LiDAR typically measures 1-3 feet too low due to logs and fern clumps interpreted as ground in the data sets. Then when I did the 90 and 100 meter counts for the later posting I had more height bands and just missed some of the trees that barely touched 99.5 meters and classified them as over 90 but less than 100 meters. 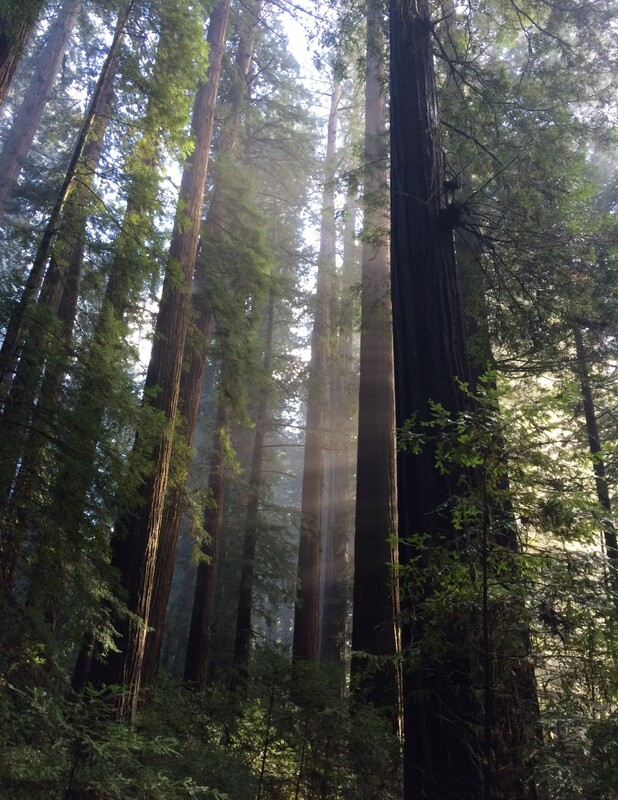 I polled a few people recently who have more comprehensive tree data and they estimated there are 5,000 to 7,000 100 meter redwood trees in total, across the entire redwood range. I never really thought about adjusting for the dense forest floor, but it really does make sense considering redwoods have the most downed woody mass of any forest. based on Figure 6 of this amazing study https://www.savetheredwoods.org/wp-content/uploads/VanPelt-et-al-2016-Maximum-biomass-and-leaf-area-in-Sequoia-sempervirens-forests.pdf its obvious that a very large percentage of the forest floor is simply downed trees, however it seems that forests south of RNP have considerably less debris, including humboldt. even though humboldt appears to not have much debris, the effect this has on LiDAR can be still be seen at 16:40 of the same presentation by Bob Van Pelt that I have referenced before https://youtu.be/xfzO74NT0kM?t=16m40s This plot fortunately appears to be the same section of Rockefeller forest that you have analyzed. as he points out, dense low lying vegetation also seems to effect the accuracy of lidar. now of coarse the lidar available to us is considerably less accrate. so maybe the effects are even more pronounced? Also the clump of regeneration in the picture seems to be sitting in the same location as Paradox. The origin date of the Humboldt LiDAR data I am using is about 2009, I don’t know how the point cloud density compares with the private LiDAR data being used by the redwoods researchers. They could be sharing some of the data sets. For sure the researchers do a better and more thorough job interpreting the LiDAR data, including height confirmations using on site measurement. Going with 99.5 meters as a cut off for 100 meter trees works well from a stand basis in Humboldt, but can be off for individual trees. If a tree is by a parking lot the LiDAR height is very accurate, versus if the tree has a big log beside it the LiDAR height can be six feet too low. From Montgomery Woods to Humboldt Redwoods to the northern redwood parks my observation is the relative density of logs on the ground is about the same. However the tan oak, rhododendron, and huckleberry cover increase from south to north, as does fern height, trunk diameter, and ground slope. So it is tougher getting around the logs up north. For the same reasons the LiDAR data for Montgomery Woods would be more accurate than Redwood National Park, for example.